Supreme Phantom – How is This a Real Magic Card? How is Supreme Phantom a Real Magic Card? Not so long ago, our own beloved MichaelJ played a 1/3 creature for 1U. Its goal was just to slow down the many 2/1 creatures of the Standard Red deck of the time. The U in its upper-right helped to power up Master of Waves, but this card had to, more or less, contribute successfully on its own. This card served Mike super well. He sided it in in the Top 8 of the Regional PTQ, essentially cancelling all the Foul-Tongue Invocations his opponent had drawn. That card was, of course, Omenspeaker. Supreme Phantom is also a 1/3 creature for 1U. But instead of a fairly minor Scry ability, it has two abilities… And they’re both doozies. 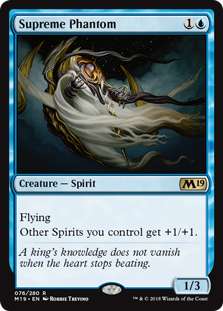 Flying is maybe the best keyword evasion ability in Magic, and its +1/+1 buff ability makes the card a perfect anchor for the Bant Spirits archetype. Supreme Phantom is obviously a great card in Bant Spirits. The Grand Prix winning list by Peiyuan Zheng plays double-digit Spirits. That starts the Phantom off with tons of potential buddies to buff. But even better? Hexproof! With Geist of Sant Traft, or, perhaps more importantly, Drogskol Captain, many a Spirit will live to smash many a face. Besides its awesome sideboard options to dominate KCI or Dredge, Bant Spirits has a solid game plan of its own. It’s got the StOmPy draw enabled by the Phantom; Bant can turn up the speed sometimes! It’s got Spell Queller. But not only that, it’s got Collected Company off the green splash! 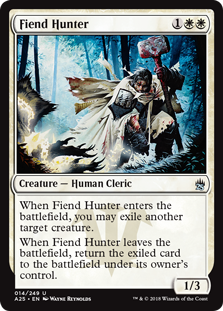 This gives Bant Spirits essentially eight permission spells in Game One (as the Company can hit Queller). While not the most specialized archetype, Bant Spirits did win the Extended Grand Prix last week, and that makes it more than worth discussing / looking at. Will Tajic, Legion’s Edge Take Over Modern? 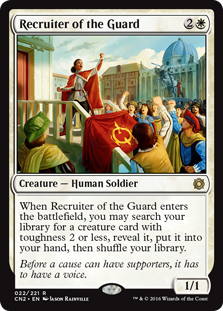 Will Tajic, Legion’s Edge break into a Humans deck near you? Further, you can drop Tajic with an Aether Vial mid-combat [with mana open]… And get a sweet block! 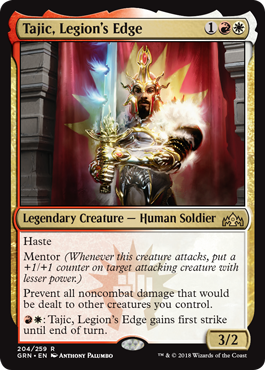 Most importantly, Tajic’s “Prevent all noncombat damage that would be dealt to other creatures you control” clause is just bananas in a deck with 35 other creatures! You can drop Tajic at instant speed not only for a sweet block, but to “counter” a burn spell. 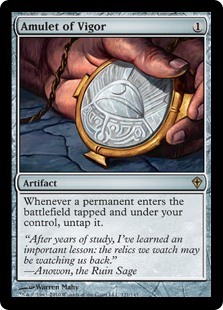 This can shut down cards like Izzet Staticaster or Grim Lavamancer that often lock down Humans. This card is amazing against sweepers. Trade your Tajic for a Slagstorm? Trade Tajic for the rest of your team. Guilds of Ravnica is Poppin’ in Modern! Risk Factor in Jund? Michael loves it, but is not in love with it. Patrick respects Risk Factor’s interaction with Liliana of the Veil. Both our hosts agree that for a deck that is sometimes beatdown, sometimes card advantage… You’re not likely to get the beatdown when you want it, and not likely to get the card advantage when you want it. But it won! Creeping Chill in Dredge! One of the week’s most exciting innovations, Creeping Chill is turning the Dredge deck design on its ear. A man with Shriekhorn in his Dredge deck means serious business. Knight of Autumn in Humans. Will it ever be “just a big guy”? Mike is a little incredulous. Knight of Autumn does what Reclamation Sage did, and the “gain four” mode is just as valuable in certain matchups. 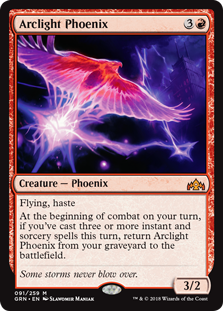 Arclight Phoenix: Simply the future of Modern. Modern. Guilds of Ravnica. What are you waiting for? It turns out Arcbound Ravager and Hardened Scales go together like peanut butter and chocolate. 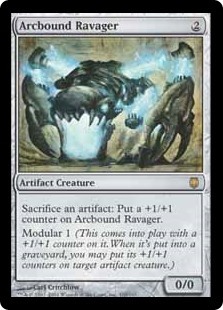 The Ravager, mightiest of Modular cards, has always been a cut above the competition. With the ability to defy card advantage and throw all your deck’s power onto one threat, this creature has wowed crowds and defined formats for over a decade. The Ravager could always sacrifice an artifact that was about to die. In that way, it could mitigate the effects of cards like Searing Blood or Smash to Smithereens. More importantly, it could create size without using mana: This let the Beast take all kinds of explosive turns for years. 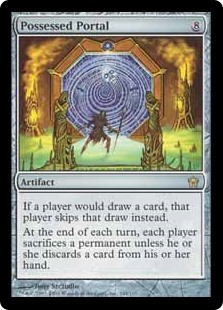 So with cards like Myr Enforcer and Somber Hoverguard all but forgotten, this Affinity two-drop has remained relevant. What happens when every Worker enters the battlefield as a 2/2? How does Steel Overseer look when this enchantment is in play on turn one? Affinity was always a good Modern deck, but with Hardened Scales, the archetype is doing something cool and legitimately new for the first time in years. The Worker dies, putting a +1/+1 counter on the Ravager. But wait! 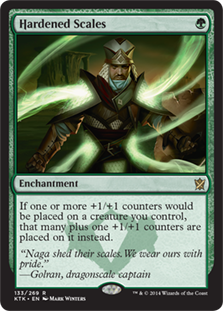 Hardened Scales says to put two +1/+1 counters on instead. Forget about cool, pretty powerful. A brand new archetype has hit Modern! Though we’ve seen other “Skred Red” decks in the past, the won played by Ozzy Kelly last week broke quite a bit of new ground. Yes, it plays Skred and Snow-Covered Mountain. The new / important part is the addition of Sarkhan, Fireblood. 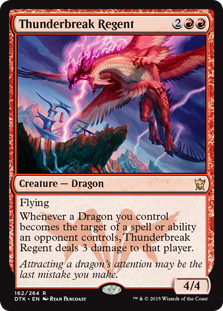 While there have been predecessors packing five drop Dragons like Stormbreath Dragon or Thundermaw Hellkite, Ozzy’s plays three different kinds, including last summers hit, Glorybringer. Sarkhan, Fireblood makes the big Dragons much faster. Predictably, this was Mike’s favorite deck of the weekend. “There is nothing about that name I didn’t like,” says of the onetime Resident Genius. Would Nicol Bolas, the Ravager Improve Skred Dragons? Just as predictably, Patrick wonders if this straight red deck shouldn’t just be Grixis… Because of course he does. Wouldn’t Nicol Bolas, the Ravager be a welcome addition to any Dragons-centric strategy? He does have a good point. But of course you can’t add Nicol Bolas and stay mono-red. The question becomes why would you want to be mono-red? The incentives are Skred (need lots of Snow-Covered Mountains) and Blood Moon. How often would you prefer Skred on one mana to, say, Fatal Push? Fatal Push is better a lot of the time, and in particular against Death’s Shadow. Death’s Shadow, of course, made a mini-comeback this past weekend. Patrick does concede that you might just want to be a Blood Moon deck. Sarkhan, Fireblood fronting a new archetype — that won the tournament, mind you — is the biggest news RE: M19 in Modern… But it’s not the only new card from Dominaria or M19 in Modern. Elvish Clancaller made a predictable debut in an Elves Overrun deck. A Crusade with upside, Elvish Clancaller is in particular synergistic with Collected Company for instant-speed buffs. Lyra Dawnbringer made numerous appearances in U/W or Jeskai Control decks… Sometimes with, sometimes in lieu of, Baneslayer Angel. 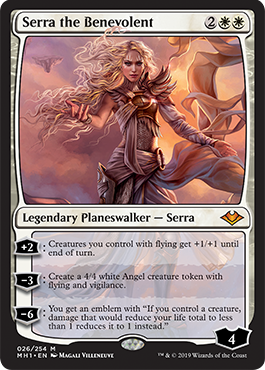 What is interesting is that Baneslayer Angel is generally better than Lyra Dawnbringer (especially if Dragons are going to be a thing)… But the first Lyra Dawnbringer is better than the second Baneslayer Angel. Rawr. Bloodbraid Elf also broke out of its ban this week; but first… Bogles!Dan Ward piloted Bogles to the Grand Prix Toronto trophy last week. Bogles! Dan Ward is one of the strongest deck designers in the world. 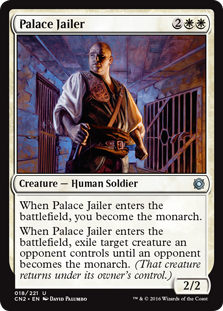 He first hit our radar with that innovative Kari Zev’s Expertise combo deck at SCG Regionals about a year ago. That deck was so awesome (or at least awesomely angled), WotC R&D banned almost immediately. Moving formats over to Standard, Dan produced a legitimate contender archetype in U/W Approach of the Second Sun. Yes that U/W Approach of the Second Sun. Dan played three copies of Leyline of Sanctity in his main deck. This may seem like an odd choice for the strategy… If it isn’t in your opening hand, Leyline of Sanctity will just clog your grip later. Further, Leyline of Sanctity provides little or no offensive value to this attack-oriented deck. Why might Dan have played it? He’s playing a Hexproof deck: With 4 copies of Slippery Bogle and 4 copies of Gladecover Scout, Ward is clearly heavy on the Hexproof plan. His creatures are largely free and clear to wear powerful buff Auras, but they’re not quite immortal. Do you know what suited up Hexproof guys hate? Edict effects. 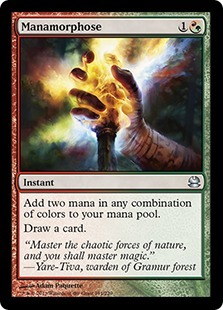 Do you know that one of the best Edict effects is also one of Modern’s Staple three-drops? Leyline of Sanctity can defend you from Liliana of the Veil. Lantern just won the Pro Tour: While it doesn’t defend you from Pyxis of Pandemonium or Ghoulcaller’s Bell, Leyline of Sanctity turns off not only Codex Shredder but the Lantern decks’ many hand destruction sorceries. It makes racing difficult: Dan was able to overcome Jon Stern’s Burn deck in the Toronto finals. Leyline of Sanctity is pretty decent against Burn decks, turning off all the Lava Spikes and taking the edge off of most of the rest of the burn cards. Can Searing Blaze suddenly target Slippery Bogle? All in all, a pretty cool three-of. Them’s fightin’ words, am I right?Fighting words or not, Dan might have a point. 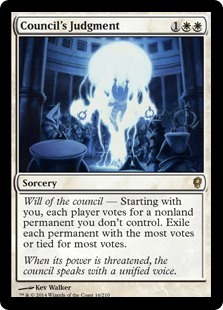 His version, with Leyline of Sanctity, actually cuts off two of Jace, the Mind Sculptor’s abilities. They can’t Fateseal or Ultimate you without answering the Leyline. Plus, unless they are on Damnation or Supreme Verdict, fast, huge, Hexproof guys can be hard to race. 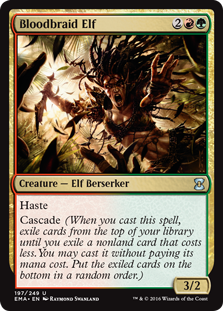 Further, if you’re planning to use Bloodbraid Elf to grab Lightning Bolt or other spot removal… That plan isn’t so good against Bogles. Plus, with a couple of buff auras, most of Dan’s cards will be able to tussle with a 3/2 and walk away, easily. Because if Champion-Bogles remains good enough, it will soon clash with Jace, the Mind Sculptor and Bloodbraid Elf in Modern!